BEARSTED BOOTS. Brown/olive green camo pattern. Sueded Leather Upper. NEW WITHOUT BOX. Rubber traction outsole. Preowned, wear and tear as expected. See soles for actual condition. Italy made boots! 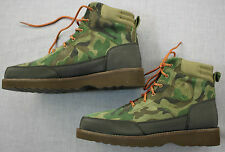 ITEM: Ralph Lauren Polo Jarrod Mid Moc 6-Eye Fashion Ankle Boots. 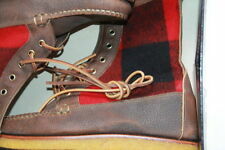 Original vintage polo ranger boots. Size 11.5 see pics for condition. From 1992/1993. AS FOUND AS IS. BOOTS AS FOUND,,,,,,,,,,GOOD BOOTS. WEAR AS IS,. as shown. RECIEVED IN CONDITION SHOWN. WEAR AS IS.LOTS OF LIFE LEFT. We will find a way solve the problem. SOLID WELL MADE BOOTS/SHOES ,QUALITY & STYLE/// AS SHOWN,,,,,,,,,,,,,,,,,,,,,,,,,,,,,. Excellent condition Ralph Lauren Denim Supply Brackley Leather Casual Boots Chukka Shoes Size 11.5 D. Gently worn on soles. See pictures! Ralph Lauren Polo Boots Size 11.5. Condition is Pre-owned. Shipped with USPS Priority Mail. RALPH LAUREN Denim Leather Supply Mens Brown Size 11.5 Chukka.